On the face of it, the Atmos Vicod 5G is just another dry herb vaporizer. However, under the shell, is this the truth? It hosts an extremely powerful 2200 mAh battery to ensure you have a decent amount of power for the best vaping experience. The Atmos Vicod 5G has gone for the traditional dry herb vaporizer style, with a standard box style mod and a built in mouthpiece. The design features a top filling mouthpiece that allows extremely good ease of access when it comes to maintaining and day to day use of your device. The Vicod has a rubber texture on the external face of the body allowing easier grip, as well as a strong and secure structure. One of the biggest marketing points for the Atmos Vicod 5G is its small portable size, and when you see the dimensions you will see exactly how small this pocket dry herb vaporizer actually is. The Vicod 5G measures in at 3.45″ height, 1.57″ length and 0.78″ width. As expected, the device is extremely light. 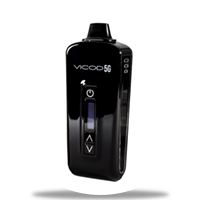 LED Screen: Typically found on the higher end vaporizers, the Vicod 5G comes with a fully functional LED screen; used to give you important information on the temperature and battery level. Adjustable Temperature: Another common feature on vaporizers, you have the a ability to increment the temperature by small or large amounts. This will give you a greater amount of control over the vapor production and heating of your dry herb. Top Filling Design: As mentioned previously, the top filling design makes it extremely easy to maintain and use the device. Having the chamber on the top also stops any obstruction of vapor when using the vaporizer. The overall performance of the Atmos Vicod 5G is outstanding. The power produced from the 2200mAh battery is more than enough to get the heat chamber going, as well as leaving a decent amount battery life. You can expect well-rounded performance from the Vicod 5G fails in little to no areas. You have the choice to use many different pulling methods with the Vicod 5G; the heating chamber gives you a huge amount of diversity. The vapor production is extremely decent as well as the taste left on the tongue. Alongside the well-performing heating chamber, the device leaves little to no odor after use, adding more points towards its claim as a portable device. Hosting a 2200mAh battery you will have plenty of power to keep you going throughout the day. Typically, a full charge will give you around 4 – 5 full sessions; however, users have reported getting at least 8 at times. The time to fully charge is normally around 1 hour, so you will never find this battery dead. The Atmos Vicod 5G is an all-in-one portable device. Therefore the assembly is down to a minimum. Not needing to assemble the device every week is great. The only assembly you will have to do is connect the mouthpiece; however, you should always ensure it is connected properly. This is one of the most important parts of owning a dry herb vaporizer, failure to look after and maintain your device correctly will greatly reduce the lifespan of your device. After each use of the device, you should always clear the heating chamber of any leftover dry herb; this will stop it becoming dry and crispy which could eventually lead to combustion. You can find any additional information in the user manual, and it’s important to read and fully understand the user manual to get the full potential out of your dry herb vaporizer. Understanding the device fully will ultimately improve your experience with the device by quite a significant amount. Available from $129.95 it is quite expensive, however, the hardware and features make this quite worth it. The Vicod 5G has an extremely strong construct, hosting an appealing design. The performance is well rounded and great. However, it is not the best. If you want a great dry herb vaporizer, and are looking around the market and need a reliable vaporizer, then the Atmos Vicod 5G is a good choice. The powerful hardware and simplicity of the device offer you satisfaction after each use. You can get you own from the Atmos website, for $129.95! The Goboof Alfa has a large price tag but you'll be getting a lot of top-end performance. It is also very compact. Is this stealthy vape worth the money? This review explores the pros and cons of the Arizer Extreme Q to help you decide if it's worth your hard-earned money. Read more to explore.